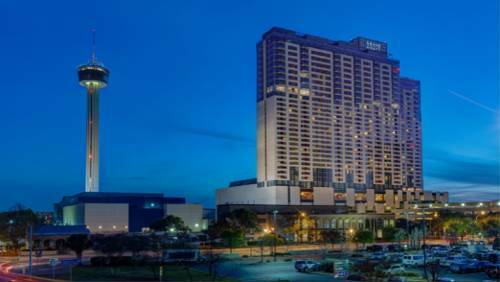 The 1003 room Grand Hyatt San Antonio is situated on the banks of the River Walk and adjacent to the Henry B. Gonzalez Convention Center. This contemporary hotel, located in the heart of downtown San Antonio, offers an entirely new level of luxury and convenience among San Antonio hotels. The Grand Hyatt San Antonio offers 63 suites and over 90000 square feet of flexible meeting space. Our location afford stunning views of downtown San Antonio of Hemisfair Park. Located in the heart of downtown San Antonio, within 5 minutes walking distance to local shopping and dining options and is 12 minutes/8 miles from San Antonio International Airport. Must cancel 48 hours prior to arrival. . Serving breakfast buffet. Happy hour is from 3pm-6pm Monday through Friday offering appetizer and drink specials.